To say that I’m proud of Marc would be an understatement. 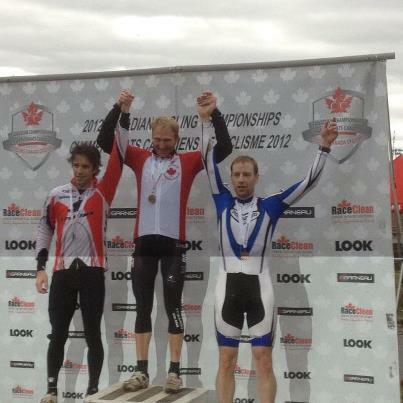 On Saturday he took second place in the Masters 40-49 category at the Canadian Cyclo-Cross National Championships. Of all the masters categories, the men’s masters 40-49 category produced the best race. Bob Welbourn was in tears after besting the 59-rider field in his first-ever appearance at a national championship. Clearly the strongest rider in the field, Welbourn punctured with three laps to go and dropped back to about 10th place as Marc Boudreau (Stevens Racing powered by The Cyclery) powered away in the lead. But Welbourn worked his way back through the field and caught Boudreau with less than 400 m to go to take an emotional victory. Welbourn is from Zimbabwe, but emigrated to Canada 15 years ago and soon became a citizen. He took up bike racing 12 years ago and has gradually turned into a respected racer in the North Vancouver area. Marc had a great Saturday. It was so awesome to hear him tell me about the race. I’m super happy for him. The build-up to the cyclo-cross season was less than perfect for Marc – having to deal with my being sick all spring/summer and then crashing and injuring his ribs. 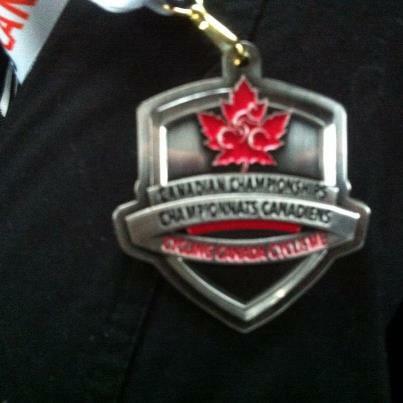 This silver medal is a testament to what hard work and focus will bring you. I can’t wait to see Marc and hear all about the race from him in person. Congrat’s Mac , way to go. ! Proud of you Marc….you write it so well Vicki. A real gift ! Sounds like that was one for the books; would have been great to be there. A good preamble to Europe, Marc. Congrats.